“Everything you see, I owe to spaghetti,” Sophia Loren once said. But to what does spaghetti owe? 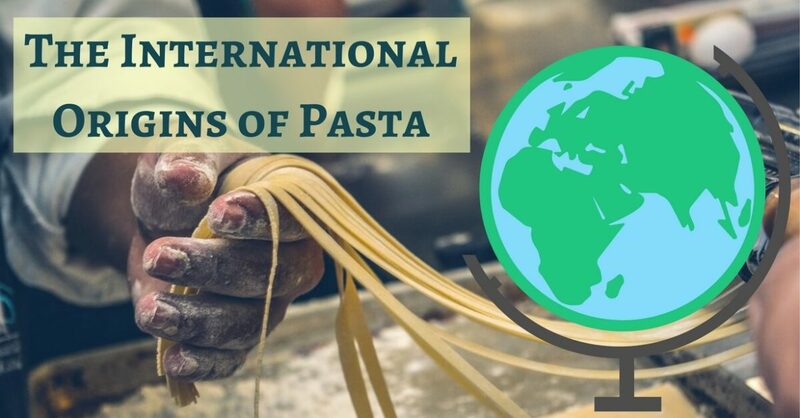 Today, we travel back in time – and around the world – to take a look at the possible origins of pasta. Long, long before pasta was a twinkle in the eye of Italy, some time before 200 BCE, the northern Chinese were already developing the art of noodle making. References to noodles and dumplings (precursors for ravioli perhaps?) appear throughout historical Chinese texts, such as an ode from 300 CE by Shu Xi (McGee notes that “poets frequently likened their appearance and texture to the qualities of silk”) and in a 544 CE document that outlines a number of flour-products, including wheat noodles. Though noodles – mian or mien in Chinese (hence lo mien) – began as a dish reserved for upper classes in northern China, over time they became a popular food among working classes. By the 7th or 8th century, McGee writes that noodles made their way to Japan, where they are called men (hence, ramen). During the medieval period, “cooks made some pastas from fermented doughs; they cooked pasta for an hour or more until it was very moist or soft; they frequently paired it with cheese, and used it to wrap around fillings” (McGee). By the 18th century, pasta was widely produced throughout Italy and was a common food amongst all classes of society. In the late 19th century, the term al dente – to the tooth – was first used to describe the perfect texture for pasta. Here at Cucina Toscana, we are proud to serve authentic Italian pasta dishes! Visit us for a taste of history.